This is my first experience in 3d printing my own stuff, though I have used shapeways in the past for ordered prints in ceramic etc. 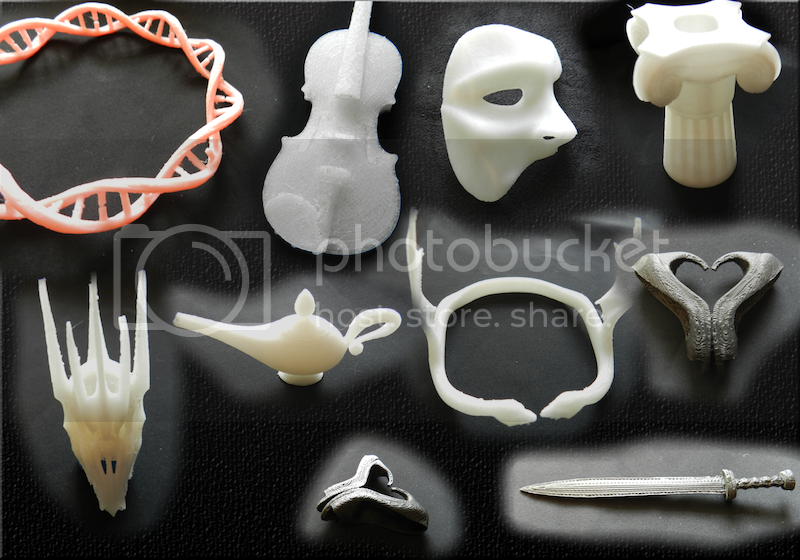 Heres a pic of some of my first prints, without any post-processing aside from a bit of filing and sanding. I'm busy experimenting now with acetone polishing and other finishing suggestions I've found on the forum. The Sauron print is awesome as are the others. Question are you having problems with objects warping? Does it print evenly? I'm waiting to get my printer gotta save up the cash in the mean time I'm observing and gathering info. It's between the Up Mini and the Up Plus in a perfect world I would have both Maybe in the future. Nice prints keep posting more. Warping is definitely the single biggest issue I've had. So far the best way i've come up with to avoid it is to make sure the platform is heated to 100C even before pressing print, as it doesn't usually wait for the platform heat to start printing, just the nozzle. So nice and hot first. Then for some other reason, I've noticed most of my warping only happens on areas towards the back right hand corner of the platform. I'm not sure why this is, perhaps some problem with the heat distribution, or it might just be me as I had a defective heater cable that possibly was already causing issues before it stopped working completely. I too researched 3D printers for several months. I watched both the Up! and the Mini in operation at an exhibition in Sydney at the end of May, and was impressed by both. In the end, a few weeks ago I bit the bullet and bought the Up!Plus. With the extra information available since then, if I was purchasing now I would definitely again pay the extra and get the Up! Plus. Bigger, better, tougher construction, and a great printer. My thoughts are that, yes it was a few hundred AUD dollars more expensive than the Mini, but the price is soon forgotten and I have to live a long time with the results from the choice I made. But then we all make choices for our own reasons. Nice prints! I'm surprised you'd see any warping with models of this type - small and curvy. The only times I've had warpage, splitting, or lifting issues it's been with large, flat objects. Preheated platform and ensuring that the first layers get mushed well into the perfboard takes care of most of them, although splits remain problematic in large objects with tall thin vertical sections. You are quite right, most of the warping I'm getting is on larger prints than these ones, I have have done some other larger pieces. Although the large base of the column did give some issues. When my printer is back up and running I'm going to see if I can decrease the nozzle height again slightly, as I might have been too nervous about smashing it into the platform when I calibrated the first time. Those prints look great ! I wouldn't worry about the nozzle getting too close to the board too much but you might want to check the extruder fastening screw is tight. 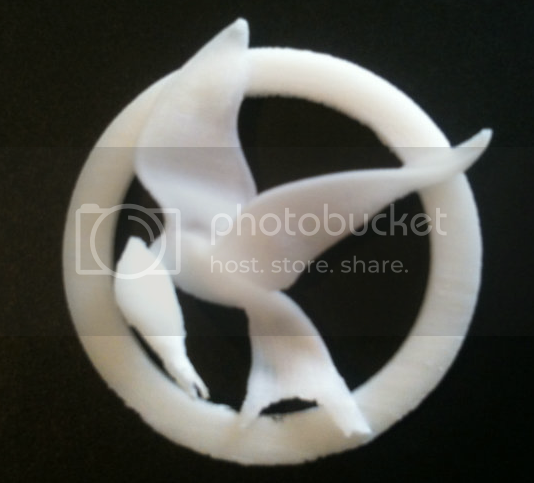 By the way, the violin model might print with better detail if you rotated it 90 degrees, so it is printed edgeways up. I didn't think thin, tall models would print and maybe fall over, but they're OK...you'll see the flat Lithophanes we have been printing edge-up elsewhere on the forum and they turn out really well. Heater arrived and we are a go! Thanks eyUP, and thanks for the tip about trying for more vertical prints, details are coming out much better that way. Sorry about terrible image, only had phone to hand. New here thinking of getting an Up plus, was wondering to get the extended warranty or not. The standard warranty is 12 months (in Australia at least). I have had my Up for several months now and have had one claim that would have cost just over $100 if the fault had occurred after the warranty finished. Whether you want to take out an extended warranty for $200 is your choice. From my personal experience the distributors in Australia/NZ (I dealt with Bilby CNC) were easy to deal with and did not try to shirk their warranty responsibilities. I think that it is more important than an extended warranty is to purchase from a reseller in your own region that has a reputation for providing good after sales service. 12 months of good service is better than 24 months of crap service. Also note that the extended warranty covers parts only with the cost of any postage or freight at your expense. A shame Bilby is now trying to pass off aftermarket filament as genuine (I was one of at least two victims just before Christmas). Also of note is your warranty is at least 12 months in Australia with the trade practices protecting us for a period that is considered "reasonable". Although that's a bit up to interpretation if it breaks after say 13 months ie just outside the normal warranty you are certainly (with rare exception) still covered. I can only speak from my own experience with Lee at Bilby. When I had a warranty issue she was prompt to resolve the problem. And, when I ordered genuine Up! black filament I received genuine Up! black filament. Wow, nice prints! Do you have a website, Thingiverse-Account or anything like that?